As you know, I just returned home from a two-week road trip around the Pacific Northwest. One of my stops was in Victoria, British Columbia, and while there I enjoyed not just one, but two lovely afternoon tea experiences. As this blog is titled Tea and Talk for Two, I thought it fitting to tell you about the first of them. And you can see I did a page spread in my Road Trip Journal about it. To set the scene: earlier that day, I had come from Port Townsend, Washington where I'd been visiting friends for several days. I enjoyed the ferry ride across the Strait of Juan de Fuca (between Port Angeles, Washington and Victoria, BC) but I was too early to check into my hotel. So I parked my luggage and car there, and headed out to find food. I was hungry. 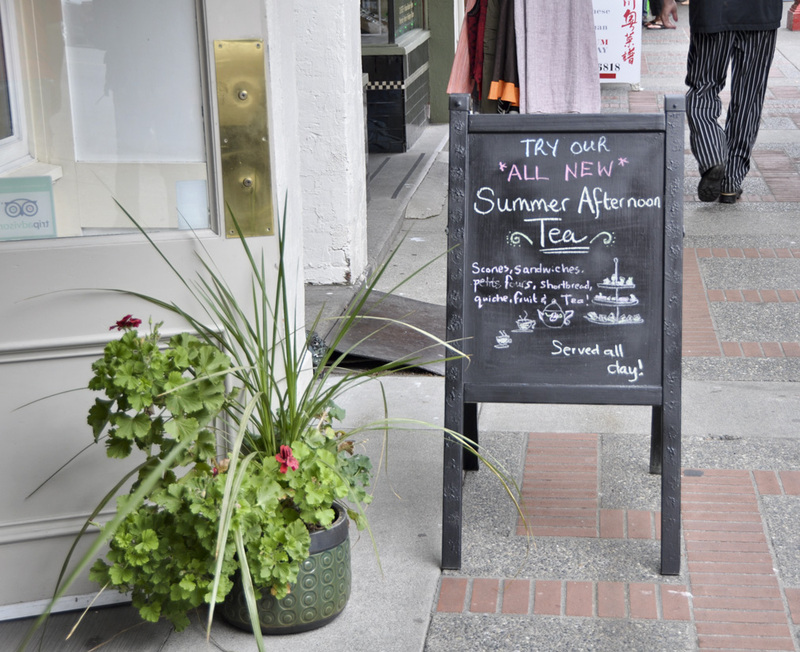 I walked for a bit when it dawned on me that I was in Victoria and there were places to get afternoon tea! 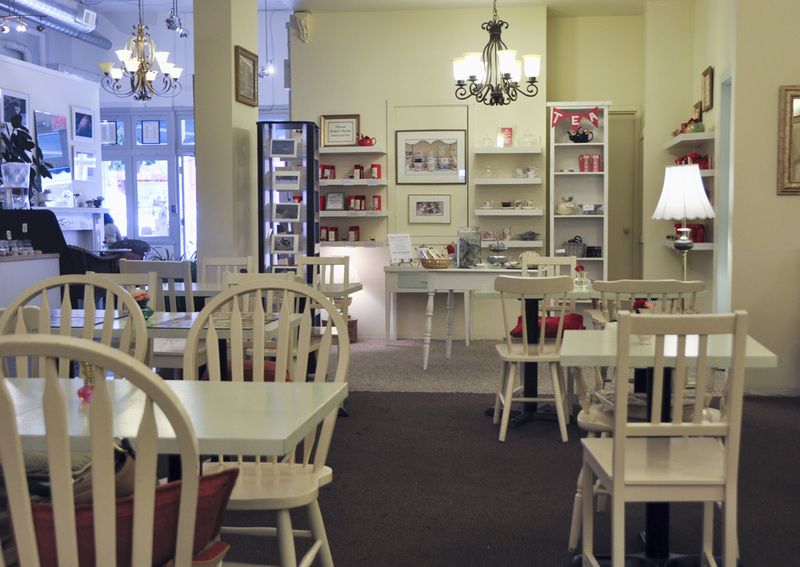 Asking in a few shops, I was directed to the Venus Sophia Tearoom which was a few blocks away. There it was. It was quiet and not crowded at all, a pleasant and homey atmosphere, not intimidating or formal in the least. I selected my tea (earl grey, my tea of choice with afternoon tea goodies) and when they brought me the beautiful tea cup, I thought I would have a go at painting it. I have to confess that if the shop had been full of people, I might have felt too self-conscious to actually paint. I might have pulled out the sketchbook, but I would have felt a bit too conspicuous with my paint palette out. But because it was quiet and there wasn't anyone around to watch (the only person near me was a woman who was engrossed in a book), I went ahead. At that point, I decided to do the whole three-tiered plate of tea goodies. And it was a struggle, I tell you -- I wanted to eat but I knew I needed to see them in order to draw them. So I had to get a good start on the sketch before I could taste anything! You can tell that I was going fast and loose. At one point, the waitress came over to ask if she could see what I was doing, and from that point on, various waitress kept coming over to peek over my shoulder as I was painting. I really appreciated their being delighted at the fact of my drawing their food -- they seemed to marvel at it, and showed great enthusiasm. So I enjoyed the painting experience, and the tea was absolutely delicious. I particularly liked the red pepper quiche, the lavender shortbread, and of course the highlight for me was the scone with jam and cream. 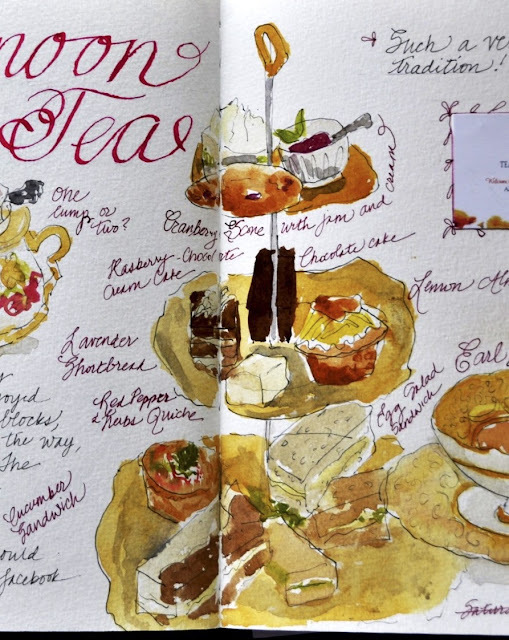 Really, the ritual of tea and a scone with jam and cream is the perfect afternoon break. When it came time to leave, the owner came over to ask if she could see the finished product, and then if she could show it to the staff as they all enjoyed watching me draw, and then if she could photograph it for their facebook page. I was flattered. This is hardly what I'd consider my best sketch and for me it was about the experience of doing it and recording the memory of being there. So it was especially nice to have them react so nicely. 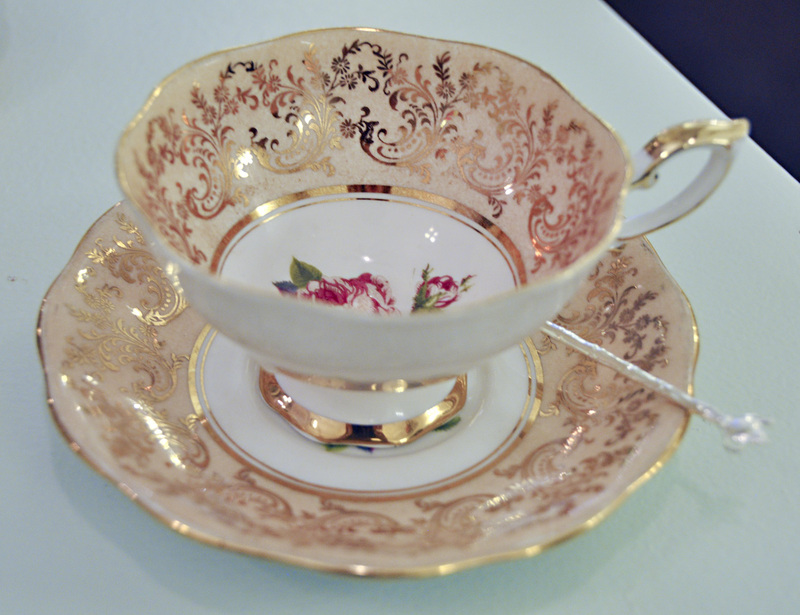 All said, I can recommend the Venus Sophia Tearoom without reservation. 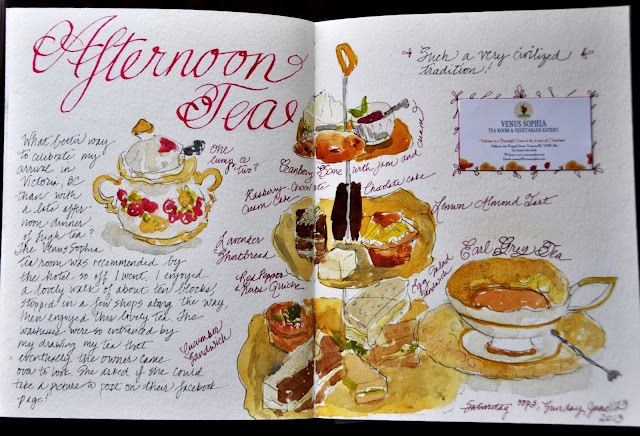 And should you find yourself there for tea, you know that you can bring out your sketchbooks and paints and they will welcome it all.